The song playing in my head for the past week comes from an old Disney movie, "When you wish upon a star." My problem with songs playing in my head is that I do not know all the words. I would not mind so much if I knew all of the words and could sing along with the melody playing in my head. You can only sing "La, la, la, la," for a short time before journeying into the land of crazyville. According to the Gracious Mistress of the Parsonage, I have visited crazyville so much she thinks I could run for mayor. I do not know what she means by that! It is now June and you know what they say about June brides. Every young girl wishes for a June wedding. I do not know why, because I know of no young man who dreams of a June wedding. In fact, weddings are the farthest thing from a young man’s mind. He has other, more sensible things he is wishing for. 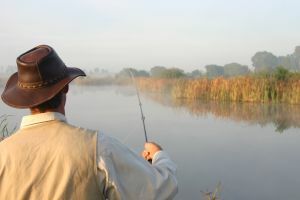 What most young men wish for in June is a day off so they can go fishing at their favorite fishing hole. What could be more sensible than that? The difference between going fishing and planning a wedding is vast and all but incomprehensible. Weddings take a lot of planning, not to mention money. I think it is at the wedding planning stage that a young woman establishes her attitude concerning money that will be with her the rest of her life. And, planning her wedding occupies all of her thinking for months at a time, if not years. However, fishing is something altogether different. A young man can wish about going fishing while he is doing something else. He may be in a classroom or on the job, wherever he is, wishing about his favorite fishing hole is a luxury only a young man can appreciate. Weddings cost a fortune, where as going fishing hardly costs anything except your time. For example, when the urge to go fishing comes a young man can drop whatever he is doing, grab his favorite fishing tackle and head for “Ye old fishing hole.” That is all there is to it. He confers with no one else. For a wedding to come off spectacularly there has to be a bride and groom. You cannot have a wedding with only one person. Fishing, on the other hand only occupies the time of one person. You do not have to lure anybody else into the activity. Another difference is in the area of multitasking. When the young woman is wishing about her wedding, she cannot think of anything else. The whole project monopolizes her thinking so she cannot do anything else. Every time you talk to her all she is talking about is her wedding and the plans associated with it. Her male counterpart can be in the middle of his fishing experience and be free to think about anything he would like to think about. He can relax and enjoy the scenery, think about what he is going to do when he gets home that evening, plan out his agenda for the job tomorrow or the class he is attending. Fishing offers a young man a wide variety of options that are missing in planning a wedding. Once the young woman casts her thoughts in the direction of a wedding, nothing else can get in the way. The young man, however, can think about fishing on the fly. Another important consideration is that a young woman only plans for one wedding. That is, unless you are some Hollywood celebrity trying to see who can have the most weddings before they die. Overall, the young woman is planning for “The Wedding” of her life. It is a one-shot deal, and when it is over all she has left are memories. Fishing is an ongoing event. It is not a one-time deal and then it’s over, but it is something that can be repeated throughout life. If one fishing experience is not completely satisfactory, there is always the next one, and the one after that. After the wedding the young woman can only boast about the man she caught. However, the young angler can boast about all those fish that got away. The more that gets away the better the fishing experience. A young woman catches one husband and then she is done. I have to mention something very similar to a woman’s wedding and a man’s fishing. The woman has one wedding dress she keeps the rest of her life, except she never wears it. The young man has one fishing vest and hat for the rest of his life, but he wears them every time he goes fishing. Nobody can spend their entire life wishing. The Bible admonishes us, “Counsel in the heart of man is like deep water; but a man of understanding will draw it out” (Proverbs 20:5 KJV). Wishing is all right but there comes a time when a person has to draw upon his counsel and apply it to something productive and glorifying to God.